This assignment is great to accompany any energy, work, or alternative energy unit. Showing students who may have been unmotivated to seek a career that there are many careers in alternative energy that pay very well and have many of advancement opportunities! 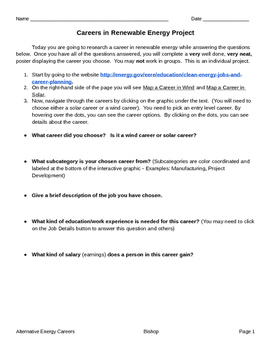 By adding the optional poster at the end of the assignment, you can then show other students, parents, and administration the career alignment education happening in your classroom!